Holland Taylor currently plays Evelyn Harper on Two and a Half Men. Her character on the Edge of Night was so evil she committed suicide in order to frame her husband. Holland Taylor, Ann Pitnoiak, and Marian Seldes,all starred in the same movie together: Bitter Blood 1994. Instead of hearing our favorite heroines together, we get to see them together in the same film. 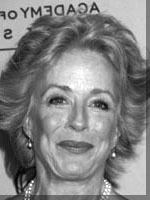 Holland Virginia Taylor (born January 14, 1943) is an American actress and playwright. Taylor began in the theater. Throughout the 1960s, '70s, and '80s, she appeared in numerous Broadway and off-Broadway productions, including starring roles in Simon Gray's Butley and A. R. Gurney's The Cocktail Hour; She took the role of Denise Cavanaugh on the soap opera, The Edge of Night, who killed herself just to frame her husband. She won the 1999 Primetime Emmy Award for Outstanding Supporting Actress in a Drama Series for her role as Judge Roberta Kittleson on the ABC drama The Practice (1998–2003). She is also known for her role as Evelyn Harper on the CBS sitcom Two and a Half Men (2003–2015 Taylor's other notable television roles include the sitcoms Bosom Buddies (1980–1982) and The Powers That Be (1992–1993). She also appeared in All My Children, Somerset, Beacon Hill, Kojak, The Love Boat, American Playhouse, Kate & Allie, Me and Mom, Harry, Murder, She Wrote, Going Places, The Powers That Be, Saved by the Bell: The College Years, The Practice and many more Her film appearances include One Fine Day (1996), George of the Jungle (1997), The Truman Show (1998), and Legally Blonde (2001). She also wrote and starred in the solo play Ann, based on the life and work of Ann Richards, for which she was nominated for the 2013 Tony Award for Best Actress in a Play.